June 25, 2017 – National Catfish Day – Day 228 P.E (Post Election). 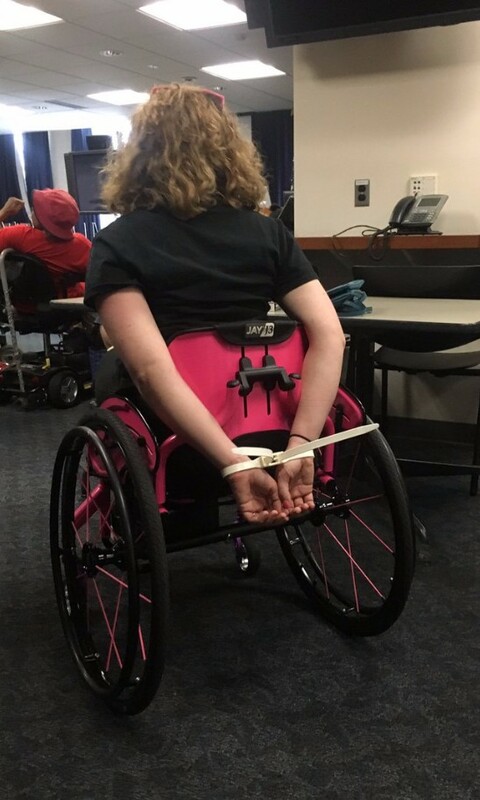 To the sounds of police dragging away wheelchair-bound protesters in front of Senator Major Leader Mitch McConnell’s (R-KY) office, the Senate Republicans unveiled their heretofore secret plan to change health care, an industry that is 1/6 of the U.S. economy and one that everyone counts on to, you know, live. Cuts Medicaid by an estimated 25% over the coming years. 64% of nursing home residents, 49% of births, 76% of poor children, 30% of adults with disabilities, and 20% of all Americans are supported by Medicaid. Reduces both the number of people eligible for health insurance premium subsidies and the dollar amount of those subsidies. Topher Spiro, Senior Fellow at the Center for American Progress, provided a couple examples of what that really means: a middle income 60-year-old in Maine would face a 208% premium increase, in West Virginia a 213% increase, and in Alaska, a 552% increase – over $30,000 per year. Allows states to require people re-apply for Medicaid as often as every month. Allows states to waive requirements on what is covered by insurance, so they can approve policies without, for example, emergency care, cancer treatment, maternity care, and abortion services. Allows for the introduction of annual and lifetime coverage caps. For those of you on employer-provided coverage, these restrictions may make their way into your plan again. Bans Planned Parenthood, which provides services like pap smears, breast exams, and HIV tests to 2.4 million people annually, from receiving Medicaid reimbursements for one year. Eliminates Medicare tax of 0.9% on earnings and a 3.8% investment income tax, for those making over $200k. This may not seem like much, but according to Vox, eliminating these taxes on just the richest 400 families in the United States costs the same as providing Medicare expansion in Alaska, Arkansas, Nevada, and West Virginia combined. But wait, there’s more! The Republicans are planning to introduce on Monday a requirement that if someone has a lapse in coverage, she is locked out of the insurance market for six months. In practice, this means when someone misses a payment, her insurance will likely be canceled. She will need to wait six months before she can apply again and at that point may not be offered equivalent insurance at the same price. Imagine how this will affect someone going through treatment for cancer. What will all these changes mean? Atul Gawande, who recently published an article on the impact of health care in the New England Journal of Medicine, put it simply: “There will be deaths.” The Center for American Progress estimates that the coverage losses from this bill, which when fully in effect in 2026, will result in 18,100 to 27,700 additional deaths that year alone. The Republicans are trying to pass an unpopular bill that will raise premiums, provide worse coverage, and lead to the early death of thousands annually – all to undo something that Obama did and to give the richest 1% a large tax break. The Congressional Budget Office will release its analysis on Monday. Traditionally, the CBO looks at a 10-year time frame. Republicans, consequently, wrote the bill so that the harshest Medicaid cuts fall just outside of the 10-year window. The CBO can look longer if they want though. How the CBO analyzes the impact of the bill may determine the outcome. Shortly after the CBO announcement, the Senate parliamentarian will rule if the bill follows the rules of that body. The Republicans are using something called “Reconciliation”, which prevents the Democrats from filibustering the bill. Reconciliation requires that the bill follow certain rules. If the parliamentarian says that it violates the rules (most likely rule violator: stopping Planned Parenthood reimbursement), the Republicans will need to make changes to the bill or blow up the legislative filibuster altogether. After that ruling, things will move very quickly. Despite holding hearings this year on important topics like hot tub safety, the Senate will not hold hearings on this bill. By comparison, there were 100 hearings on the Affordable Care Act before it was approved. The Republicans can only lose 2 votes from their own party and still pass the bill. A handful of Republicans have come out against the bill “as written”. Four of them, Senators Ted Cruz (TX), Rand Paul (KY), Mike Lee (UT), and Ron Johnson (WI), think the bill doesn’t go far enough in repealing the ACA. But even without any changes, there is no way these four actually stop the Affordable Care Act from being repealed. In 2013, Ted Cruz read “Green Eggs and Ham” in a filibuster attempt of Obamacare. If Cruz stops this bill from being approved, I’ll eat all 142 pages of the bill in a box with a fox. Expect McConnell to throw these four some cruel bone and they’ll get out of the way. The only hope is a few Republicans from purple states decide not to vote to kill their constituents. Senator Dean Heller (R-NV) has come out against it. He boldly called out that the doctor has no scrubs, saying it is a “lie” that this bill would lower premiums. Almost immediately, a pro-Trump PAC, America First Policies, announced a seven figure media campaign against Heller. Yes, Republicans are attacking Republicans. This friendly fire serves as a warning to Senators Shelly Moore Capito (WV), Bill Cassidy (LA), Susan Collins (ME), Lisa Murkowski (AK), Rob Portman (OH), and Ben Sasse (NE) to not break rank. If the Senate passes this, the buzz is the House will pass that version immediately, putting it on Trump’s desk so he can declare independence from Obamacare or some other horrific talking point before July 4. The next 72 hours will decide if the richest country in the world will take health care away from its poorest citizens to give a small percentage tax break to its richest. To see what you can do to stop this cynical bill from reversing our society’s progress, read this guide from Indivisible. If you’re in the D.C. area, there will be a human chain in front of the U.S. Capitol on Wednesday at 5pm. Under the Twitter handle @PresVillain, comic book creator D.M. 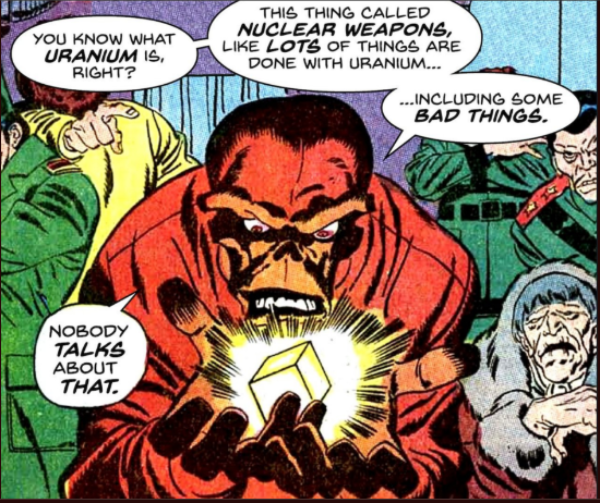 Higgins has been putting real Trump quotes into old Marvel comics with the Red Skull. Pay No Attention to the Man in Front of the Oval Office Curtains – After threatening former FBI Director James Comey that Comey “better hope that there are no ‘tapes’ of our conversations,” Trump admitted this week that he didn’t actually have any tapes. Trump then claimed that he made the threat (i.e., intimidated a witness) to make Comey think there were tapes so Comey would not lie in his testimony. Trump declared that his gambit worked. Wait. If Trump’s total B.S. plan worked, then that means Comey’s testimony was true. On June 9, Trump accused Comey of lying under oath. What an impeachment case we weave . . .
It’s a Big Boo Boo to Allow Killing of Boo Boos in Yellowstone – Perhaps influenced by Education Secretary Betsy DuVos declaring them a threat to our schools, U.S. Fish and Wildlife Service removed grizzly bears in the Greater Yellowstone region from the Endangered Species List. Nothing to See Here, Literally – The Trump administration took another step towards an authoritarian state by not allowing video or audio recordings into the daily White House press briefing. CNN resorted to sending their Supreme Court sketch artist to the briefings. That the media is not challenging this more directly is deeply troubling and emboldens the administration. The week ended with Sarah Huckabee Sanders declaring that media was not allowed to even report her announcement that the White House was banning video and audio. Yep, the media is banned from reporting that there is a ban. Let the Water Hold Me Down – National Park Service officers went undercover this past weekend and handcuffed three African American teens for selling water at the National Mall. Something tells me if the NPS encountered the Bethesda cheerleading squad doing a fundraiser, the interaction may have gone differently. Ground Zero for Our Values – Every week, there is a new tragic story from the administration’s attacks on immigrants. This week, it’s the story of someone who was there for the U.S. when it was attacked. Ground Zero recovery worker, Carlos Cardona, is currently locked up and fighting deportation. Cardona, who has been in the U.S. since 1986 and is married to a U.S. citizen, suffers from respiratory problems from his months of work at the World Trade Center site. Trumpy Cracked Corn and I Don’t Care – In his never-ending attempt to fill the emptiness in his soul, Trump held a rally this week in Iowa. One of the biggest applause lines was when Trump declared that all new immigrants should be barred from using welfare for 5 years. What Trump and the children of the corn didn’t know was this has been the law of the land for over 20 years. You can find more of the lies he told at the rally, here. Happy Anniversary to Not Being Able to Vote! – Today is the 4-year anniversary of the Supreme Court gutting the Voting Rights Act, which had required federal oversight of voting in several states. The attack on voting rights began almost immediately after that ruling. Just two hours after the decision, Texas implemented a voter ID law allowing you to vote with a gun permit but not a student ID. In 2016, states previously covered by the Voting Rights Act advance approval or “preclearance” requirement, provided 868 less polling places, making it more difficult for many to vote. This year, 99 bills have been introduced in 31 states to make voting harder. Oh, also, 25% of Florida’s black citizens are disenfranchised. Hateful Crimes – This week, a Muslim teenager in Virginia was assaulted, kidnapped, and murderedwhile walking home from McDonald’s after observing Ramadan at her mosque. The police are not investigating it as a hate crime, but road rage. Later this week, a memorial for her was set on fire. Police are also contending this is a coincidence and the arsonist was not targeting the memorial. The Muslim community does not quite share these interpretations of the events. Trump Violates Virgin (Grass) – This week, we found the one thing that Trump’s base is finally willing to criticize him about: he drove his golf cart on the green. Carriering Jobs to Mexico – In November, Trump made a big announcement that he was bribingincentivizing Carrier with $7 million to keep jobs in Indiana rather than ship them to Mexico. On Friday, Carrier announced it was laying off 600 workers beginning in July. Northkarolinastan – You may recall that since November, when the voters of the North Carolina had the unmitigated temerity to elect a Democrat governor, the Republican super-majority controlled General Assembly has made several attempts to take over the government. Courts have mostly blocked their attempts at stripping the governor of his power and have demanded that the General Assembly redraw its racially gerrymandered districts. Rather than admitting defeat in the courts and accepting they are in a democracy, Republicans are . . . trying to prevent the governor from suing them. The General Assembly’s proposed budget prevents the governor from using the governor’s office attorneys without the General Assembly’s permission. Show Me Discrimination – The Missouri legislature is on track to approve a strict anti-choice bill that overturns a St. Louis ordinance which prevents employers and landlords from discriminating against women who have had an abortion, use contraceptives, or become pregnant. Deep in the Cold Heart of Texas – This week, Texas Governor Greg Abbott (R) signed a bill that allows publicly funded religious foster care and adoption agencies to deny services “under circumstances that conflict with the provider’s sincerely held religious beliefs.” The unstated purpose is to allow agencies to deny placement with LGBT parents. Texas would rather deny a home to foster children in need than to place them with LBTQ families that otherwise meet all the required criteria for placement. A great piece of investigative reporting in The Washington Post on “Obama’s secret struggle to punish Russia for Putin’s election assault”. If you’re really looking to lose sleep, think about how Trump would handle a similar situation. An expert on authoritarian states, Sarah Kendizor, writes about the darkness of our times in “Trump is the best autocrat. The best. Nobody has a better autocrat than we do“. Just in case you skipped over the link to the Indivisible Guide on Stopping TrumpCare, I’m putting it here again. 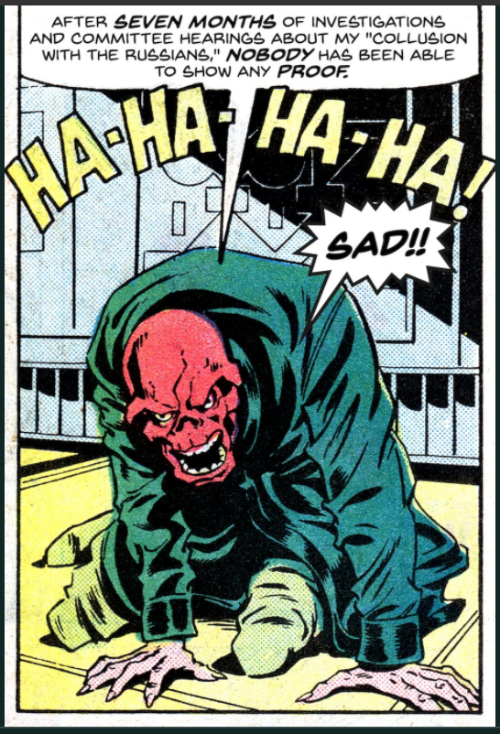 If the Senate “heath care” bill passes, people will die. Do something about it.